82 MMS January 2017 mmsonline.com FEATURE so on, before regenerating a new program. The type of tool used for fluting depends on how many channels a particular rotor has. For large shafts that have perhaps six flutes, a Sand- vik high-feed face mill is used to create the cool- ing channels, because there is ample space between flutes. For rotors that have many more flutes, a Sandvik 10-inch slot cutter is used (see photo above). The M-80's capabilities have spurred the facil- ity to use carbide tooling instead of high speed steel as it had traditionally used, too. 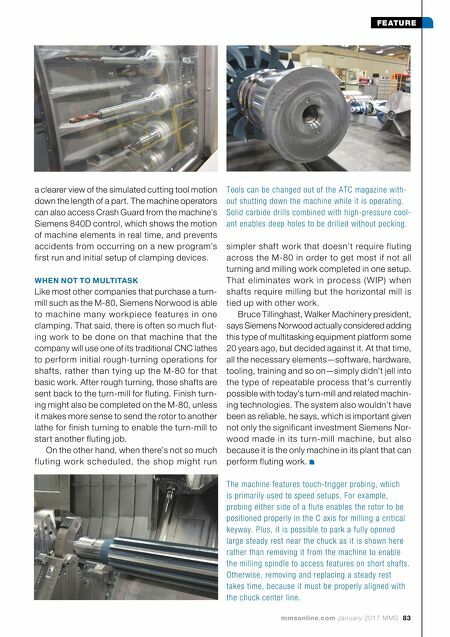 Mr. Lassan- dro says the facility takes advantage of the M-80's 1,160-psi through-tool coolant delivery to provide effective chip evacuation while using solid carbide drills. In some cases, it would take several minutes to drill a 4-inch-deep hole on a horizontal mill by pecking with a high speed steel drill. That same hole now takes only 15 seconds to create without pecking using a solid carbide drill and high- pressure through-tool coolant delivery. In-process part probing also plays a role. Tools can be automatically measured using a WFL tool- setting probe, eliminating the need to perform offline tool measurement or manual touch-offs. An M&H touch-trigger probe is also used primar- ily to set all machine offsets. For example, after fluting work is completed on a rotor, the rotor's C-a xis zero position is determined by probing either side of one flute to ensure that the keyway machined at that location is positioned precisely at the center of that flute. Each part program that is developed is verified through offline Crash Guard Studio simulation software. This software uses CAD models of all machine elements, workholding devices, tooling and so on to ensure there will be no interferences or collisions during the actual operations on the machine. 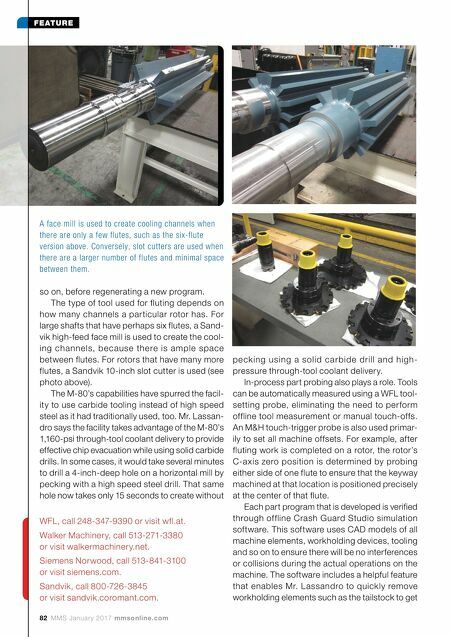 The software includes a helpful feature that enables Mr. Lassandro to quickly remove workholding elements such as the tailstock to get A face mill is used to create cooling channels when there are only a few flutes, such as the six-flute version above. Conversely, slot cutters are used when there are a larger number of flutes and minimal space between them. WFL, call 248-347-9390 or visit wfl.at. Walker Machinery, call 513-271-3380 or visit walkermachinery.net. Siemens Norwood, call 513-841-3100 or visit siemens.com. Sandvik, call 800-726-3845 or visit sandvik.coromant.com.